I’ve always been a big fan of laser reflecting puzzles, as they often meet that sweet spot between logic and trial-and-error. You can get pretty far just fiddling with the pieces and adjusting them until you achieve the goal, but you get farther if you also have a bit of a plan. I also love when games innovate, bringing something completely new to the table, and even more-so if it feels like magic. Splitter Critters was a great example of that, and the new puzzle game, BLASK, actually reminds me somewhat of a new game the Splitter Critters developer has been working on. Only visually, though. Mechanically, BLASK feels wholly original, unlike anything I’ve played before. 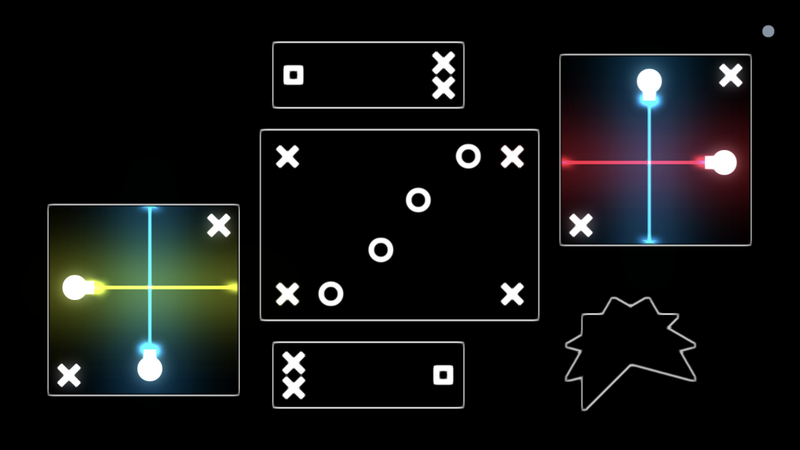 What makes BLASK so unique — even thought it uses lasers, something seen in plenty of puzzle games — is that you merge geometric shapes through which the beams can travel. They bounce off the edges, but you can change the edges by either rotating a shape or even combining multiple shapes. It’s a bit hard to explain and much easier to understand if you see it in action. But the overall effect is super trippy. And it’s not just a gimmick, either. The game offers some real mind-benders, thanks in part to its well-crafted and constantly evolving mechanics. 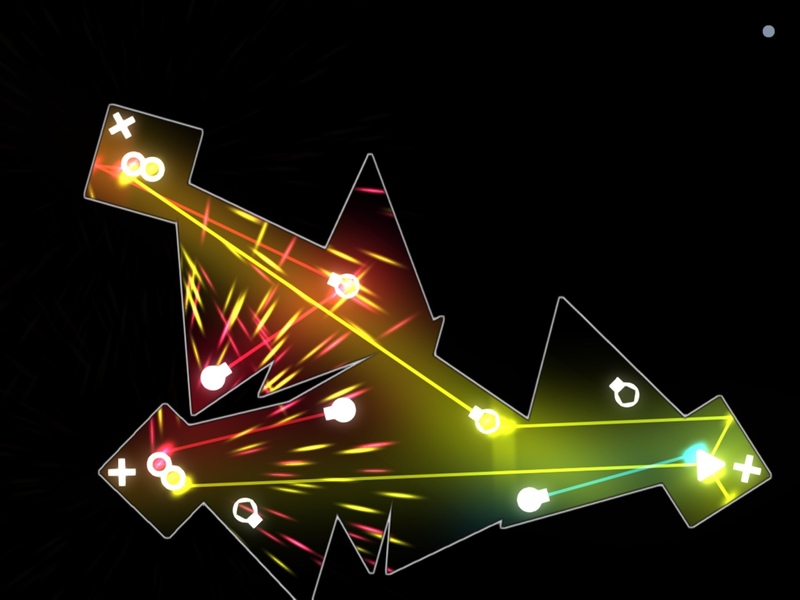 For instance, there are three colored lasers, and they each have different properties. Red lasers can only bounce off walls once, yellow can bounce twice, and blue can bounce three times. When they each hit their max, they just get absorbed by the wall. It might seem strange at first, but it allows for some pretty tricky puzzles. 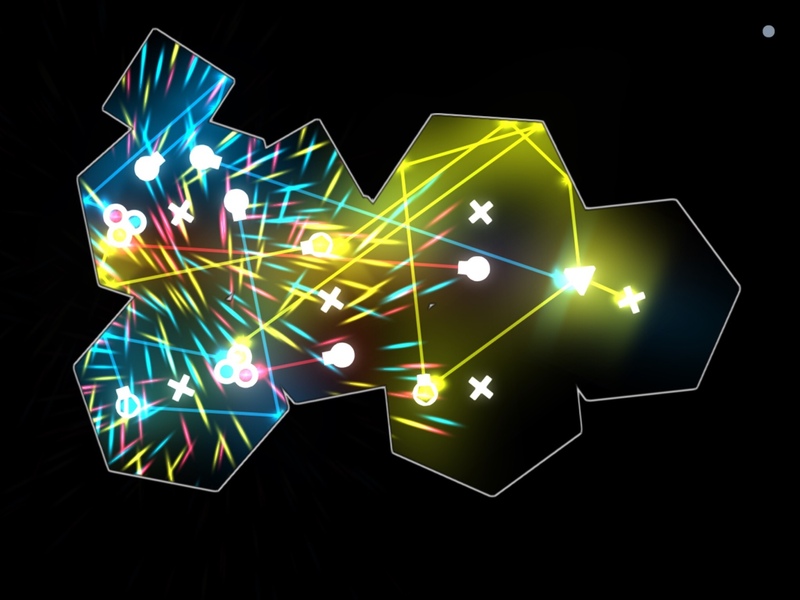 In each of the sixty-odd levels, your goal is to hit all the little white rings with lasers. At first, you just move two pieces together to close the gap and allow the laser to pass through. But soon enough you’ll start encountering shapes that are bolted down. Some will be able to pivot around a single bolt, while others will be completely stuck in place. These restrictions mean you can’t just move all the lasers next to the rings and call it a day. Instead, you have to figure out where to place the free-moving shapes alongside the bolted ones so that the lasers can bounce off the walls to rings. Later, prisms are introduced that both change the color of the laser and split it into three branches. Plenty of other mechanics are added at a comfortable pace, but I’ll let you discover the rest for yourself. Thankfully, the game has a very minimal tutorial, and instead teaches through play. You figure out what things do by tinkering around, the best way to learn. One of the things I love about the game is how each level starts, often appearing to be one big shape until you start pulling at it and it breaks apart. There’s a moment where it all feels quite daunting, because what seemed like five pieces is actually ten. While some levels have pretty straightforward solutions without much room for creativity, most have a ton of freedom, allowing for multiple solutions to work. They still challenge you, but the amount of freedom makes it feel sometimes like a cross between a toy and a game, as you’re messing around with the shapes and the lasers, not yet sure what your plan is but still having fun seeing what happens when things interact. I would often take breaks when the scope of a puzzle felt a bit overwhelming. But that just meant that I paced myself and didn’t rush through the game too quickly. 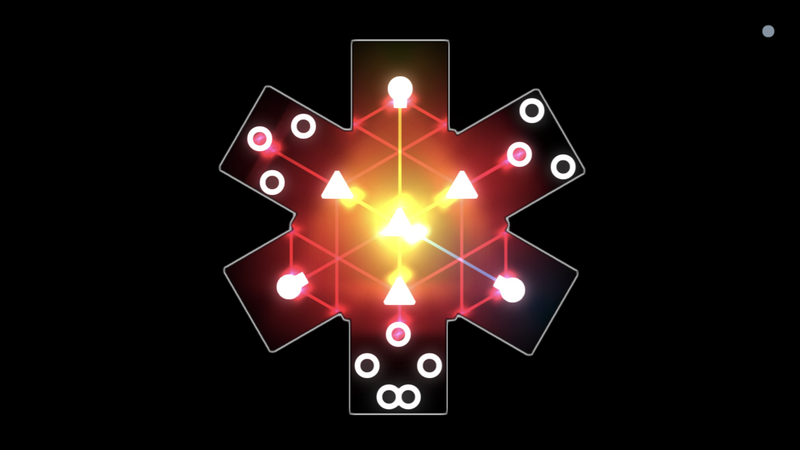 Overall, I had a great time with BLASK, between trying to solve the puzzles and just marveling at the magic that ensues when two shapes overlap. But there were some issues that are worth mentioning. The controls can be fiddly and oversensitive, a problem that’s exacerbated if you’re on a small screen. Sometimes a laser would move when I lifted my finger off the screen, forcing me to make adjustments. If your solution is a tight one, you could be fiddling around with it for a while to get the laser to stay perfectly in place. So you’ll need to have some patience with it. It’s less of an issue on a big iPad, but it never truly goes away. And on a small screen like an iPhone, you might also find that your finger covers too much of a shape while you’re adjusting it. There’s also less free space to work with on an iPhone, so you can’t really spread things out while you think. And last, it can be difficult sometimes to grab a specific shape when several are overlapping. I liked the game enough to work around these issues, but I can see where others might get frustrated and quit. There are also some quality of life improvements I’d like to see, such as iCloud sync. Because the game is much more enjoyable on an iPad, I would have preferred not to have to always catch up on my iPhone. But the developer did say he wants to add that in an update. Also, I’m a big fan of minimalist design, and really appreciate that there’s nothing on the screen besides the puzzle but a little dot that opens the menu. I just wish the menu included a level select screen instead of arrows to scroll through them. It’s clunky and time-consuming this way. And BLASK is a game that has some replay value due to the amount of freedom. People may want to revisit older puzzles and try to find a more optimal solution. The current user interface makes it feel like a chore to find your favorite level. And last, the game is a bit of a battery hog, so it’s probably best played at home and not on the go. Despite some issues, BLASK is a game I would highly recommend for people of all ages. It’s a trippy experience that’s fun to mess around with even if you’re not that great at solving its puzzles. With the disheartening direction the App Store is taking these days, it’s so refreshing to see that there are still some developers releasing smart and innovative games that aren’t meant to nickel-and-dime you. These are the kinds of unique experiences I live for, and the reason I continue to have hope for the future of mobile gaming. So instead of downloading another soulless game designed to trick you into joining a weekly subscription, grab BLASK and remember what made you fall in love with iOS gaming in the first place. 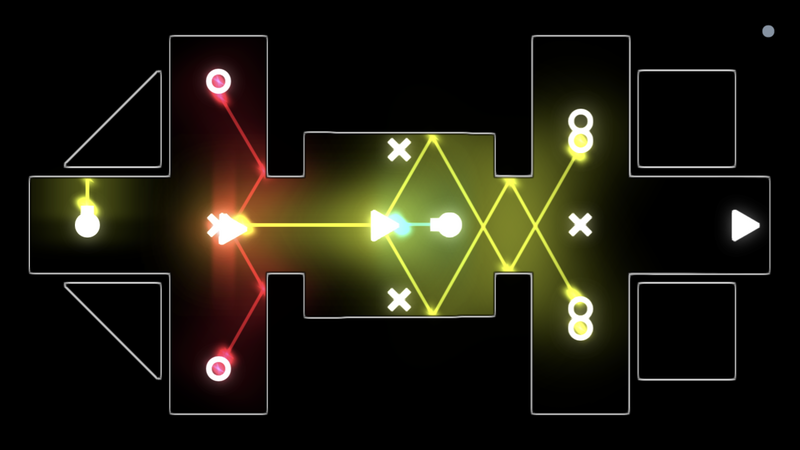 And if you need help with any of the puzzles, try my walkthrough guide.